Konica Minolta is pleased to announce that the company has been awarded Good Design Award 2015 by Japan Institute of Design Promotion (JDP) for its A3 monochrome MFP (multi-functional peripheral) bizhub 367/287/227,” and its mobile application “bizhub Remote Access.” It is highly recognized that both hardware and software are designed in a wholly balanced manner. Design Concepts of “bizhub 367/287/227” and “bizhub Remote Access”“bizhub 367/287/227” and “bizhub Remote Access” follow bizhub series' unified concept “INFO-Palette,” and set the goal both in achieving total design and strong brand for products, after-sales support and promotional materials. The bizhub 367/287/227 have operation panel smaller than the more high-speed upper models. On the panel, text and multi-touch icons are widened properly while equal visibility and operability are kept: they are easy for users to understand and operate its multiple functions. bizhub Remote Access enables not only remote operation from almost anywhere in the office, but also comfortable and efficient operational performance by displaying the MFP panel screen on the user's favorite mobile device. As the collective design concept for bizhub series MFPs, “INFO-Palette” is utilized. Since user contact points are concentrated to symbolic white-plate motif on the MFPs' front side, its contrast to the black body is intuitively recognized by users as operation and control component. Regarding accessibility, remote operation from mobile devices that are used on daily basis, easiness to hold grip of paper cassette from upper and lower side, color universal design including screen display, and comfortable flick operations are thoughtfully designed for various office workers. Hardware and software are designed in a wholly balanced manner. Features of “bizhub 367/287/227” and “bizhub Remote Access”“bizhub 367/287/227” are monochrome MFPs that Mobile Touch Area is newly added on the operation panel and cooperation with mobile device is further enhanced. 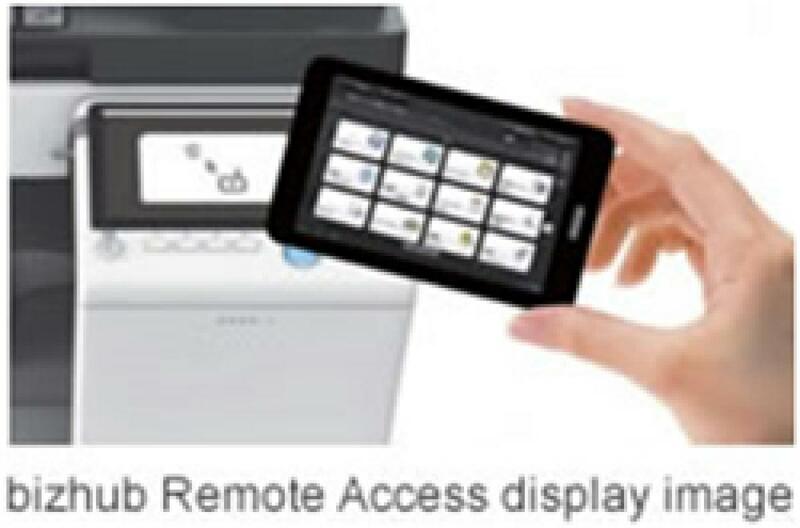 When the application for mobile device, “bizhub Remote Access” is installed, users can do remote operation by displaying the MFP panel screen on the device screen. For users, a corporate mobile printing environment based on the BYOD approach offers maximum flexibility and convenience.